Today, high definition has become the name of the entertainment game. HD TV’s have a household proliferation rate of 75 percent in the United States; this is up from 2011 when only 23 percent of the households in the country had these types of televisions. As the dominion of traditional CRT TVs continues to diminish, more HD ready options are starting to flood the market. With so many devices starting to utilize the HDMI standard, the common two or three HDMI jacks that are on most HDTVs is starting to be a woefully inadequate amount of connectors. To combat this high resolution war of attrition the HDMI switch was invented. With this device you can use one HDMI jack on your TV to pick up feeds from several different devices. As with any nascent tech, there are tons of choices for the average user on the market today, so we’ve gone ahead and done the research into which units are best. Our Gold Pick, as always, is almost universally loved by critics and consumer groups and comes to us from Kinivo, a company that is based in the U.S. and provides quality electronics at a very reasonable price. This HDMI switcher has several great features that will fit well into your home theater setup and ensure vivid high resolution content from all of your connected peripherals. To start, this is a very futuristic looking device. It features several indicator LEDs set in a small rectangular box that is black on the top surface and white along the sides. Its measurements are seven inches in width, 2.5 inches in depth, and one inch in height. 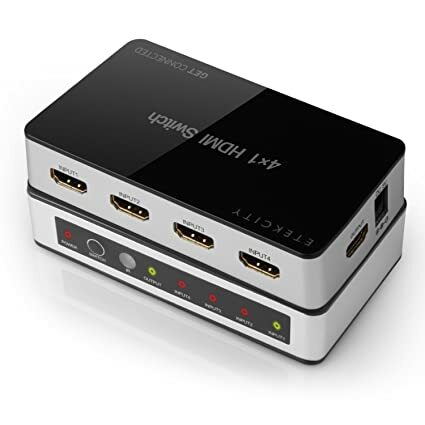 The four HDMI jacks are positioned along one of the wider edges of the device and consist of one output that connects directly to your HDTV and three inputs that you wire directly to your peripheral devices. Typically, with the HDMI inputs that come with TVs today, you simply hit the source button on your remove to switch through all of your various HDMI and RCA peripherals. Fortunately, you can do that with this device by way of the included slimline remote. This remove uses a similar design aesthetic to the device itself, but is exceptionally thin. The remove features touch sensitive pads that will allow you to cycle through input channels via an up and down switch, or choose between the channels directly via buttons labeled one through three. 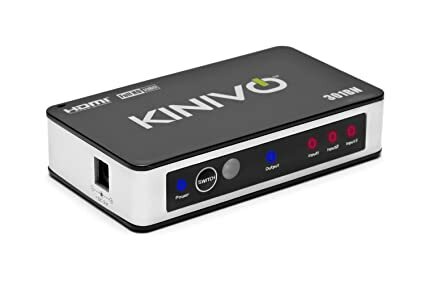 For ease of use, Kinivo has also included automatic switching functionality into the design of this HDMI switcher. The box will notice when you power on a device like a PS4 or Blu-Ray player, and switch channels automatically. This functionality makes the whole process more simple and organic. Unfortunately, this device can only broadcast in a maximum 1080p, for devices that work in Ultra HD resolutions, you might be better served finding a device that can handle 4k. This HDMI does support 3D TVs, so your 3D standard definition television will display beautiful video from any connected peripheral. 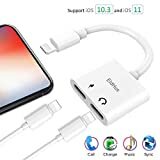 Also, since this device has to handle seamlessly connecting three high definition streams through two HDMI wires at a time, there is a slight connection lag when it is establishing a connection; this is relatively minor since there is veritably no lag once the connection is set up. Despite these slight foibles, this is a great HDMI switch that will perform well. As a Gold Pick winner, you also know that it’s a popular selection among consumers. On Amazon, an impressive 85 percent of the 4,122 reviewers have granted this device a four star rating or above. The overall consensus is that this is a very reliable machine that has a great looking design that fits well in any home theater. Our Silver Pick runner up is produced by J-Tech, a company that has had home electronics as its primary business vertical since 1987. Today, J-Tech specializes in connectors and items that bolster home entertainment like HDMI switchers and splitters have become a key focus for the company. This item, J-Tech’s three port HDMI switch, really shines as a great addition to any home entertainment setup. At first glance, you’ll notice that this HDMI switch has a very unassuming form factor. It’s a small black box that has three input HDMI connectors on one of the longer sides and an output HDMI connector positioned along one of the shorter sides. Insofar as the device’s dimensionality, this HDMI switch measures in at three inches in width, two inches in depth, and one inch in height, which definitely makes for a relatively tiny device that will barely be noticeable amongst your HD peripherals. When it comes to user experience, this HDMI switcher has a fairly stable operation structure. On the device’s structure there is a switcher button and LEDs that will let you know which HDMI input is being utilized currently. Simply adjust to the correct input channel and after a brief pause the connection will be established. Similarly to the control scheme on our Gold Pick, this HDMI switcher also features a remote control for those times when you would rather not get up to switch the device manually. It also sports a similar control setup to the one created by Kinivo, there are three buttons for each HD input channel, and two buttons that will allow you to manually cycle through each channel in order. This remote is slightly thicker than the previous entry, but that doesn’t really affect the user experience. 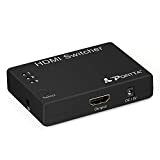 If you’re intending to buy this switcher, there is one caveat that you should consider: as with many of these types of devices, the switcher will only provide an HD experience that is aligned to the lowest device on the input chain. For example: if you have a Blu-Ray player that provides 720p resolution, a PS4 that can broadcast 1080p, and a X-Box One that has a similar resolution, the switcher will only produce a resolution that matches the Blu-Ray’s highest potential resolution. To avoid curtailed HD, definitely consider the max resolutions of the peripherals you intend to attach to the device. Like our Gold Pick, this device only works at resolutions up to 1080p, so consider that as the base level of HD quality that you input through this unit. Our Bronze Pick is manufactured by Etekcity. Etekcity offers a plethora of electronic home devices that are designed to bring your household into the 21st century. These types of devices include home automation systems, high tech appliances, and of course, home theater electronics. This HDMI switcher has a very similar shape and design to our Gold Pick switcher. The top is black the sides are white, and you’ll find four HDMI jacks along one of the longer sides. The chief difference between the two devices is that whereas the Gold Pick has four HDMI slots that include an HDMI output, the Etekcity model incorporates an additional output on the side; the four that are side by side are all inputs. This ensures that you’ll have the ability to connect four HD ready devices through this switcher; an excellent feature. Another key differentiator between this unit and the others on our list is the fact that it can receive Ultra HD signals. For those who have devices that can broadcast in this level of detail, such as the rumored Playstation 4 Neo, this could be a boon for your home theater setup. The remote that comes with this switcher is significantly more feature rich than the other switchers on our list. That is because it can serve as a universal remote for the playback of digital files. Also, this device incorporates a picture in picture (PIP) mode that will allow you to display all of your input signals through your monitor or TV at one time. This is also a unit that will allow you to turn off the auto switching mode; this is a great feature if you plan on running multiple HDMI input signals at the same time through the PIP function. Being a baller on a budget doesn’t mean that you should settle for cheaply made nonfunctional products that aren’t worth the hassle. Here is a great HDMI switcher that has some great features but also won’t break your bank in half. This Portta switcher utilizes a 3×1 system similarly to our Gold and Silver picks. This means that it has three HDMI inputs and a single HDMI output that feeds directly into your TV or monitor. Also like those models, this has a maximum resolution of 1080p. From an aesthetic perspective, this unit is also more understated than many of the other devices, with a very thin form factor. It measures in at 3.5 inches in width, 2.5 inches in depth, and a nearly miniscule 0.8 inches in height. The result of this is a very small device that you or your guests will hardly notice. The remote that comes with this unit is very small, and features three channel selector buttons and eschews the up and down button that’s available on the other units on this list. There is also a selector button on the device itself, and you can find out which HDMI input channel you are on by way of a bright LED. “I have to say this no-name switch outperforms the pros. I needed to connect my ps3 (hdmi) and dish receiver (hdmi) to an hdtv which only had a dvi input (using an hdmi to dvi cable). It’s really important not to be shortsighted when selecting a HDMI switch. Picking a switch that will allow you to hook up two devices might seem fine now, but what if you get another peripheral in the near future? When purchasing a HDMI switcher, it’s better to err on the side of more jacks rather than a lower amount; it’s a kind of future-proofing that will ensure that you will always have space for more peripherals. This falls under future-proofing. Currently, the next batch of high resolution TVs don’t ascribe to the former 1080p standard; these new wave of TVs will all broadcast HD content at almost four times this resolution at Ultra HD levels of clarity. Right now, there aren’t a lot of devices that can provide this 4k level of resolution when it comes to content, but the list is expanding every day. 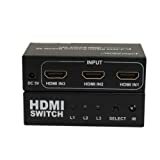 Unfortunately, not all of these types of HDMI switchers are compatible with the new Ultra HD standard, so be sure that when you are ready to purchase one, that the model you select is ready for this type of high resolution content. • Automatic Switching – For this type of switching system, the device automatically can sense when a new HD peripheral has been turned on and automatically switches to that peripheral. This is perfect for situations where you’ve just turned on your TV and then powered on your X-Box One. With this type of switching system, the box will automatically switch to your game system. • Manual Switching – This type of switching system is important as well. Sometimes you will have multiple peripherals running concurrently for whatever reason. When this happens, it’s actually inconvenient to rely on the automatic switching system. Manual switching will allow you to specifically select the peripheral that you want by way of a remote or via on board switching. Running up to the TV will bless you with more steps in a day! Seriously though, having a remote that will let you quickly switch among peripherals will add a degree of ease to your home theater experience. Typically, the remotes for these types of devices are wafer-thin, so be sure that you place it in a location where it will not get lost. Connectivity is quickly becoming the name of the game in today’s society, so it’s great to know that no matter the amount of peripherals that you need to connect to your HD display, you’ll have coverage if you use a HDMI switcher. This list has some absolutely great options when it comes to this style of device, and the pre-purchase considerations offer you some great things to ponder on when you are looking for a new unit. Whatever device you end up choosing, we hope that the information that we’ve provided here will help you achieve the high resolution experience that you are searching for.